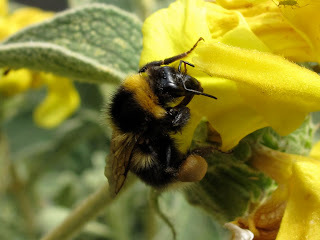 BugBlog: Why are common bumblebees common? Six species of bumblebees in the UK buck the trend for population declines in other species. Of the 25 species of bumblebees, 3 are considered extinct, and a few others are restricted to a few sites. The common six (with the Tree Bumblebee soon set to become a 7th), however, are widespread and often very abundant in gardens. Why is that given how similar bumblebees are? All species have similar life cycles, feed on nectar and pollen and most lack specific habitat requirements. Their morphology is also remarkably similar, with the most important differences being tongue length (associated to head shape) and body size. Do these differences reflect different foraging preferences? Foraging preferences might be very apparent to gardeners, with some species having a strong preference for a particular plant. For example only Bombus hortorum (above, on Phlomis) and Bombus pascuorum, the two species with the longest tongue, visit foxgloves. Surprisingly, bumblebee foraging preferences were not known until recently, when Goulson and colleagues studied the foraging preferences of most UK bumblebee species on a number of sites on South England, Scotland and New Zealand (where several species were introduced at the end of the 19th century). The first interesting result they found is that pollen and nectar was collected by bumblebees from a different array of plants. Fabaceae (bean family) was preferred both for pollen and nectar collection whereas asteraceae was very used for nectar collecting but rarely for pollen. 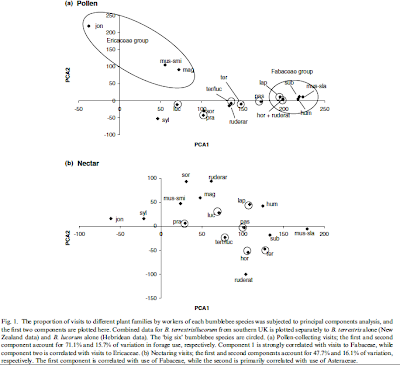 This could indicate differences in pollen quality amongst plant families. 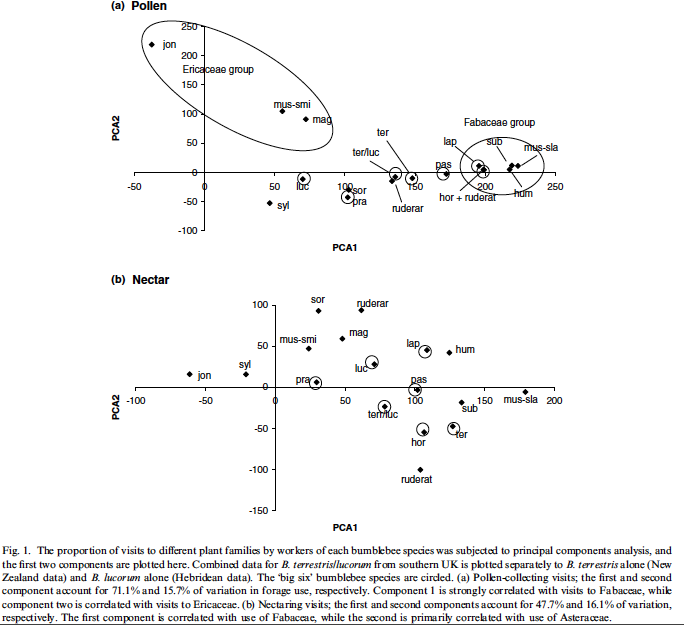 When investigating the differences between common and rare species, pollen use was most important. A group of species are Fabaceae pollen collecting specialists, and others are heath specialists. Common species appear in the middle of the plot, indicating less specialisation and broader diets. Goulson and collaborators suggest that the abundance of B. hortorum, a relatively specialised, long-tongued species, could be due to there being ecological space for only a single species specialised on long-corolla species given the declining numbers of long-corolla species in the countryside. Emergence time was also correlated with rarity. The common six are all either early species or mid season species. Late emerging species seem to have suffered disproportionately. These late species are medium or long tongued and they appear late as they feed on unimproved grasslands (hay meadows for example), and this is a declining habitat in the last decades. In the paper they discuss that the loss of these habitats increased when vehicles replaced horses as means of transport and the decline of bumblebee species might be an unexpected legacy of the mechanisation of the countryside. Besides forage plants, nesting preference also has to be considered. The commoner species do well in gardens and will nest in all manner of locations: underground, under paving slabs or even bird nestboxes, whereas many of the rarer, later nesting, grassland species nest above ground in (or under) grass tussocks (hence the term 'carder' bee). Not much tussocky grass in manicured gardens. Bombus pascuorum seems to buck this trend but as it's an early species there's probably something temperature related going on here (added to the forage preference). Bombus hortorum also does well because of its liking for many crops. Because of their deep flowers, it's a major pollinator of broadbeans for instance. Thank you Norwegica. Nest preferences is something they don't discuss in the paper at all.